Jiangsu (Simplified Chinese: 江苏; Traditional Chinese: 江蘇; pinyin: Jiāngsū; Wade-Giles: Chiang-su; Postal map spelling: Kiangsu) is a province of the People's Republic of China located along the country's eastern coast. Jiangsu borders Shandong to the north, Anhui to the west, and Zhejiang and Shanghai municipality to the south. Its name comes from jiang, (short for the city of Jiangning (now Nanjing) and su (for the city of Suzhou). The abbreviation for this province is "苏" (sū), the second character of its name. Jiangsu has a coastline that extends over a thousand kilometers along the Yellow Sea, with the Yangtze River passing through its southern parts. Since the inception of economic reforms in 1978, Jiangsu, like many of the other areas along the "gold coast" of China, has been a hot spot for economic development, and now has emerged as one of China's most prosperous provinces. The economic divide between the rich southern regions and the impoverished north remains a prominent issue in the province, as does the national divide between rich and poor, which has steadily increased ever since the implementation of economic reforms. During the earliest Chinese dynasties, the area of what is now Jiangsu was far removed from the center of Chinese civilization, which was predominantly located in the northwest of the country in what is currently Henan. 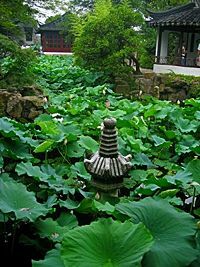 During the Zhou Dynasty, more contact was made between these two areas, and eventually the state of Wu (centered at Gusu, now Suzhou) appeared as a vassal to the Zhou Dynasty in south Jiangsu, one of the many hundreds of states that existed across northern and central China at that time. Near the end of the Spring and Autumn Period, Wu became a great power under King Helu of Wu, and in 484 B.C.E. was able to defeat the state of Qi, a major power in the north in modern-day Shandong province, and contest for the position of overlord over all states of China. The state of Wu was subjugated in 473 B.C.E. by the state of Yue, another state that had emerged to the south in modern-day Zhejiang province. Yue was in turn subjugated by the powerful state of Chu from the west in 333 B.C.E. Eventually the state of Qin swept away all the other states, and established China as a unified nation in 221 B.C.E. Under the reign of the Han Dynasty (206 B.C.E. to 220 C.E. ), which brought China to its first golden age, Jiangsu was a relative backwater, far removed from the centers of civilization in the North China Plain. Jiangsu at that time was administered under two zhou (provinces): Xuzhou Province in the north, and Yangzhou Province in the south. Although south Jiangsu was eventually the base for the kingdom of Wu (one of the Three Kingdoms from 222 to 280), it did not become significant until the invasion of northern nomads during the Western Jin Dynasty, starting from the fourth century. As northern nomadic groups established kingdoms across the north, the ethnic Han Chinese aristocracy fled southwards and set up a refugee Eastern Jin Dynasty in 317, in Jiankang (modern day Nanjing). From then until 581 (a period known as the Southern and Northern Dynasties), Nanjing in south Jiangsu was the base of four more ethnic Han Chinese dynasties, who each faced off with rival northern barbarian (but increasingly sinicized) dynasties. In the meantime, north Jiangsu acted as a buffer of sorts between north and south, and while it initially started as a part of southern dynasties, as the northern dynasties began to gain more ground, it became part of the northern dynasties. In 581, unity was reestablished again between the two sides under the Tang Dynasty (618-907). During this period, China once more went through a golden age, although Jiangsu was still rather unremarkable among the different parts of China. It was during the Song Dynasty (960-1279), which saw the development of a wealthy mercantile class and emergent market economy in China that south Jiangsu emerged as a major center of trade. From then on, south Jiangsu, especially major cities like Suzhou and Yangzhou became synonymous with opulence and luxury in China. Today, south Jiangsu remains one of the richest parts of China, and Shanghai, arguably the wealthiest and most cosmopolitan of mainland China cities, is a direct extension of south Jiangsu culture. The Jurchen Jin Dynasty gained control of North China in 1127, and the river Huaihe, which used to cut through north Jiangsu to reach the Yellow Sea, became the border between the north under the Jin, and the south under the Southern Song Dynasty. The Mongols later took control of all of China in the thirteenth century, and the Ming Dynasty which was established in 1368 after driving out the Mongols, initially placed its capital in Nanjing. Following a coup by Zhu Di (later Yongle Emperor), the capital was moved farther to the north, to Beijing. (The naming of the two cities continues to reflect this, as "Nanjing" literally means "southern capital," and "Beijing" literally means "northern capital.") At this time, the entirety of modern day Jiangsu as well as neighboring Anhui province kept their special status as territory-governed directly by the central government, and were called Nanzhili (南直隸 "Southern directly-governed"). Meanwhile, South Jiangsu continued to be an important center of trade in China, and some historians observe in the flourishing textiles industry of the time a nascent industrialization process and the growth of capitalism, which was a trend that was later aborted, several centuries before similar trends took hold in the West. The Qing Dynasty changed the status of Jiangsu by establishing the Nanzhili areas as Jiangnan province. In 1666, Jiangsu and Anhui were split apart as separate provinces, and Jiangsu was given approximately the same borders that it has today. With the start of the Western incursion into China in the 1840s, the rich and mercantile south Jiangsu was increasingly exposed to Western influence, and Shanghai, originally an unremarkable little town of Jiangsu, quickly developed into a metropolis of trade, banking, and cosmopolitanism, and was later split into an independent municipality. South Jiangsu also played a central role in the Taiping Rebellion (1851-1864), which was a massive and deadly rebellion that attempted to set up a Christian theocracy in China. This movement started far to the south in Guangdong province, but swept through much of South China, and by 1853 had established Nanjing as its capital, renaming it as Tianjing, which means "Heavenly Capital"). 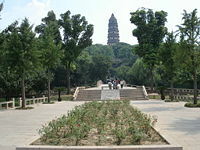 The Huqiu Tower of Tiger Hill, Suzhou, built in the year 961. The Republic of China was established in 1912, and China was soon torn apart by warlords. Jiangsu changed hands several times during this chaotic period, but in April 1927, Chiang Kai-Shek established a government at Nanjing and he was soon able to bring most of China under his control. This increase in order was abruptly interrupted by the second Sino-Japanese War, which began full-scale in 1937. On December 13, 1937, Nanjing fell, and the combined atrocities of the occupying Japanese for the next 3 months would come to be known as the Nanjing Massacre. 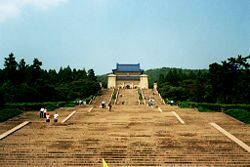 Nanjing became the seat of the collaborationist government of Eastern China under Wang Jingwei, and Jiangsu remained under occupation until the end of the war in 1945. After the war, Nanjing once again became the capital of the Republic of China, though now the Chinese Civil War had broken out between the Kuomintang government and Communist forces based further north, mostly in Manchuria. The decisive Huaihai Campaign was fought in northern Jiangsu, resulting in Kuomintang defeat and the subsequent seizure of Nanjing by the communists. The Kuomintang fled southwards, and eventually ended up in Taipei, from which the Republic of China government continues to administer Taiwan and its neighboring islands, though it also continues to claim (technically, at least) Nanjing as its rightful capital. 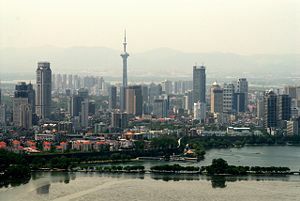 After communist takeover, Beijing was made capital of China and Nanjing was demoted to be the position of provincial capital of Jiangsu province. The economic reforms of Deng Xiaoping initially focused on the south coast of China, in Guangdong province, which effectively left Jiangsu behind. However, starting from the 1990s these reforms have been applied more evenly to the rest of China. As a result, Suzhou and Wuxi, two southern cities of Jiangsu in close proximity to neighboring Shanghai Municipality have become particularly prosperous, placing among the top 10 cities in China in gross domestic product and outstripping the provincial capital of Nanjing. While the level of economic growth in Jiangsu has increased rapidly since the 1970s, the growing income disparity between north Jiangsu and south Jiangsu remains a major issue for the People's Republic of China. Town of Zhouzhuang, Jiangsu. South Jiangsu is famed for its towns crisscrossed by canals. Jiangsu is very flat and low-lying, with plains covering roughly 68 percent of its total area and water covering another 18 percent. Most of the province stands less than fifty meters above sea level, which has allowed Jiangsu to create a well-developed irrigation system, and has earned it the title of shuǐxiāng, or the "land of water." A great example of this can be seen in the southern city of Suzhou, which is so crisscrossed with canals that it has been dubbed the "Venice of the East." The Grand Canal of China cuts through Jiangsu from north to south, traversing all of the provincial river systems running east to west. The Yangtze River, the longest river of China, cuts through the province in the south and reaches the East China Sea. Mount Yuntai near the city of Lianyungang is the highest point in this province, with an altitude of 625 meters. Historically, the Huaihe River, a major river in central China and the traditional border between North China and South China, cut through north Jiangsu to reach the Yellow Sea. However, starting from 1194 C.E., the Yellow River further to the north changed its course several times, running into the Huaihe River in north Jiangsu each time instead of its other usual path northwards into the Bohai Bay. The silting caused by the Yellow River was so heavy that after its last episode of "hijacking" the Huaihe ended in 1855, the Huaihe was no longer able to go through its usual path into the sea. Instead, it flooded, pooled up (thereby forming and enlarging Lake Hongze and Lake Gaoyou), and flowed southwards through the Grand Canal into the Yangtze. The old path of the Huaihe River is now marked by a series of irrigation channels, the most significant of which is the North Jiangsu Irrigation Main Channel (苏北灌溉总渠), which channels a small amount of the water of the Huaihe along its old path into the sea. Jiangsu Province spans the warm-temperate/humid and subtropical/humid climate zones, and has clear-cut seasonal changes, with temperatures at an average of -2 to 4°C in January and 26 to 30°C in July. There are frequent rains between spring and summer (meiyu), typhoons with rainstorms in late summer and early autumn. The annual average rainfall is 800 to 1,200 mm, concentrated mostly in summer when the southeast monsoon carries rainwater into the province. 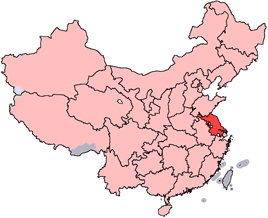 The 13 prefecture-level divisions of Jiangsu are subdivided into 106 county-level divisions (54 districts, 27 county-level cities, and 25 counties). Those are in turn divided into 1488 township-level divisions (1078 towns, 122 townships, one ethnic township, and 287 subdistricts). See List of administrative divisions of Jiangsu for a complete list of county-level divisions. Jiangsu has an extensive irrigation system supporting its agricultural sector, which is based primarily on rice and wheat, followed by maize and sorghum. Some of the province's important cash crops include cotton, soybeans, peanuts, rapeseed, sesame, ambary hemp, and tea, while other products include peppermint, spearmint, bamboo, medicinal herbs, apples, pears, peaches, loquats, and ginkgo. Silkworms also form an important part of Jiangsu's agriculture, with the Lake Taihu region to the south serving as a major base of silk production in all of China. In addition to this, Jiangsu is abundant in marine life, including the yellow-fin tuna, hairtail, changfish, shrimp, algae, and shellfish. As such, it serves as an important source of freshwater fish and other aquatic products for the country. In terms of mineral resources, Jiangsu has sizable reserves of copper, lead, zinc, silver, gold, and manganese. It also has coal, petroleum, and natural gas deposits, but its most significant mineral products are non-metal minerals such as halite (rock salt), sulfur, phosphorus, cyanite, sapphire, diamond, limestone, quartz sand, clay, and marble. The salt mines of Huaiyin have more than 0.4 trillion tons of deposits, which make it one of the greatest collections of salt in China. Jiangsu has historically been oriented towards light industries such as textiles and the food industry, but since 1949, the province has also developed other industries machinery, electronics, chemicals, construction materials, and an automobile industry. The economic reforms of Deng Xiaoping have greatly benefited southern cities, especially Suzhou and Wuxi, which outstrip the provincial capital Nanjing in total output. In the eastern outskirts of Suzhou, Singapore has built the Suzhou Industrial Park, a flagship of PRC-Singapore cooperation and the only industrial park in China that is in its entirety the investment of one single foreign country. Jiangsu is very wealthy among the provinces of China, with the second highest total GDP (after Guangdong Province). Its GDP per capita was 14,500 yuan in 2002, but geographical disparity is great, and southern cities like Suzhou and Wuxi have GDP per capita around twice the provincial average, making south Jiangsu one of the most prosperous regions in China. In 2004, Jiangsu's nominal GDP was 1.54 trillion yuan (US$191.42 billion), making it the third largest GDP of all the provinces and an annual growth rate of 13.5%. Its per capita GDP was 16,796 yuan (US$2,029). The share of GDP of Jiangsu's primary, secondary, and tertiary industries were 8.9 percent, 54.5 percent, and 36.6 percent respectively. The share of GDP by the public and private sector was 49.0 percent and 51.0 percent respectively. A multi-tiered educational system including pre-school education, elementary education, education for the disabled, vocational education, higher education and adult education is now in place in Jiangsu. According to statistics taken at the end of 2000, Jiangsu had 71 institutes of higher education with 451,800 students and 33,100 teachers, 4,222 junior and senior high schools with 4.34 million students and 250,200 teachers, and 19,100 primary schools with 7.19 million students and 289,000 teachers. In the past several years, overall education levels have risen tremendously. In 2000, the illiterate population was 4.69 million, but that represented a significant decline from 1990, when the illiterate population was 11.56 million. Along with this, the illiterate population totaled 17.23 million in 1990, but in 2000, it was down to 6.31 million, a decrease of about 10.93 percent. The province of Jiangsu was formed in the seventeenth century, and before that time the northern and southern parts of the province had a much weaker cultural and economic connection. Traditionally, the notion of South Jiangsu has been associated with the cultural makeup of the three major cities of Suzhou, Wuxi and Changzhou, all of which have cultures that are distinct from the rest of the province and have come to be known collectively as Wu culture. The other parts of the province are dominated by the so-called "Jianghuai Culture," which is comprised of the cultures of the area between the Yangtze River and Huaihe River. In history, the term North Jiangsu refers to the cities to the north of the Yangtze River. For the cities of Nanjing and Zhenjiang, neither of the two terms (North Jiangsu and South Jiangsu) can be applied, because although they are to the south of the River, culturally they are still part of the Jianghuai Region. Since about 1998, a new cultural classification has been used frequently by the government and mainly defined by economic means. It groups all the cities to the south of the Yangtze River as South Jiangsu, the cities of Yangzhou, Nantong and Taizhou as Middle Jiangsu, and all the rest of the province as North Jiangsu. Two main subdivisions of the Chinese language, Mandarin (not Putonghua, the national standard speech based on the Beijing dialect, also commonly called Mandarin) and Wu, are spoken in different parts of Jiangsu. 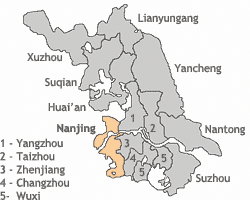 Dialects of Mandarin are spoken over the traditional North Jiangsu, Nanjing and Zhenjiang, while Wu is used in South Jiangsu. Mandarin and Wu are not mutually intelligible, and the dividing line is sharp and well-defined. In addition, Standard Chinese (Putonghua/Mandarin) is also spoken by most people in the province. Jiangsu is rich in cultural traditions. Kunqu, originating in Kunshan, is one of the most renowned and prestigious forms of Chinese opera. Pingtan, a form of storytelling accompanied by music, is also popular and it can be subdivided into types by origin: Suzhou Pingtan (of Suzhou), Yangzhou Pingtan (of Yangzhou), and Nanjing Pingtan (of Nanjing). Xiju, a form of traditional Chinese opera, is popular in Wuxi, while Huaiju is popular further north, around Yancheng. Jiangsu cuisine also holds the distinction of being one of the eight great traditions of the Chinese cuisine. Suzhou is famous for its silk, embroidery art, jasmine tea, stone bridges, pagodas, and its classical gardens. Nearby Yixing is famous for its teaware, and Yangzhou is famous for its lacquerware and jadeware. Nanjing's yunjin is a famous form of woven silk, while Wuxi is famous for its peaches. Since ancient times, south Jiangsu has been famed for its prosperity and opulence, and simply inserting south Jiangsu place names (Suzhou, Yangzhou, etc.) into poetry gave an effect of dreaminess, a literary trick which was used by many famous poets throughout Chinese history. In particular, the fame of Suzhou (as well as Hangzhou in neighbouring Zhejiang province) has led to the popular saying: 上有天堂，下有蘇杭 (above there is heaven; below there is Suzhou and Hangzhou), a saying that continues to be a source of pride for the people of these two currently prosperous cities. The majority of Jiangsu residents are ethnic Han Chinese. However, in addition to the ethnic Han group, Jiangsu is also home to 55 minority ethnic groups with a total population of 210,000, accounting for 0.29 percent of the provincial total. Some of these minorities include the Hui and the Manchus. 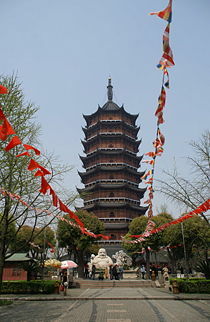 Jiangsu is a province that is blessed with an abundance of tourist sites. Nanjing was the capital of several Chinese dynasties and contains a variety of historic sites, such as the Purple Mountain, Purple Mountain Observatory, the Sun Yat-sen Mausoleum, Ming Dynasty city wall and gates, Ming Xiaoling Mausoleum (The mausoleum of the first Ming Emperor Zhu Yuanzhang), Lake Xuanwu, Jiming Temple, the Nanjing Massacre Memorial, Nanjing Confucius Temple, Nanjing Yangtze River Bridge, and the Nanjing Zoo. Suzhou is renowned for its classical gardens (designated as a UNESCO World Heritage Site), as well as Hanshan Temple, and Huqiu Tower. Nearby is the water-town of Zhouzhuang, an international tourist destination where Venice-like waterways, bridges and dwellings have been preserved over centuries. Yangzhou is known for its Thin West Lake, and Wuxi is known for being the home of the world's tallest Buddha statue. In the north, Xuzhou is designated as one of China's "eminent historical cities." This page was last modified on 5 May 2018, at 15:22.